MGA's first graduates of the Master of Arts in Teaching program are shown after the May 8 commencement ceremony. They are, left to right, Deborah Walsh, Julie Andrews, Stephanie Pekarek, and Terrie Lewis. Not pictured: Nathan Westray. 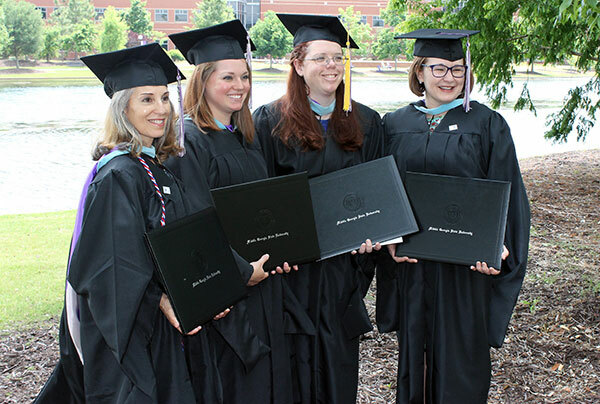 In early May, five students became the first graduates of Middle Georgia State University's Master of Arts in Teaching. Middle Georgia State (MGA) launched the graduate degree in summer 2017. The first graduates, most of whom participated in the May 8, 2018, commencement ceremony, are Julie Andrews, Terrie Lewis, Stephanie Pekarek, Deborah Walsh, and Nathan Westray. "We are thrilled to reach this milestone just one year after beginning to offer the degree," said Dr. Randy Spaid, the master’s degree program coordinator for MGA’s School of Education and Behavioral Sciences. "These first five graduates will represent us well as they start their education careers." MGA's Master of Arts in Teaching is designed for people with bachelor's degrees in English, biology, math, or history who want to get certification to teach at the high-school level. Students take three foundational classes to get started, then get teaching experience as graduate interns at area high schools. Courses are taught primarily online, with limited face-to-face interactive sessions and seminars flexibly scheduled to meet at the school where students are getting teaching experience or in the evenings. The MAT is also attractive to current teachers who have provisional certification and want to earn an advanced degree in order to get initial certification. For more information about Middle Georgia State’s Master of Arts in Teaching, go to https://www.mga.edu/education-behavioral-sciences/graduate-programs.php.